Elsa needs our help! We are the only one who can save her ear! Elsa needs an ear treatment because her hearing got damaged after she played with some icicles who got into her ear. Today the main doctor is missing from the hospital because he has some serious family problems. Elsa needs our help! We are the only one who can save her ear! What do you think? Can you help Elsa? Be a doctor for a day and follow all the instructions in order to do the procedure right. Enjoy! 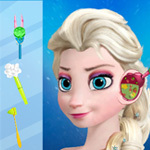 Use the mouse to select the tools on the right side of the game and clean Elsa's ear. Elsa needs an ear treatment because her hearing got damaged after she played with some icicles who got into her ear.